Under Secretary-General for United Nations Peacekeeping, Jean-Pierre Lacroix (left) greets members of the Tanzania People's Defence Force following the deaths a year ago of 15 Tanzanian peacekeepers in the Democratic Republic of the Congo. A year on from the brutal killings of 15 United Nations peacekeepers from Tanzania in the Democratic Republic of the Congo (DRC), the head of Peacekeeping Operations (DPKO) paid a visit to some of the victims’ families on Friday, to honour the memory of the soldiers who died in what was the biggest single loss of ‘blue helmets’ in recent history. Speaking on the island of Zanzibar, home to 13 of the men, Under Secretary-General Jean-Pierre La Croix promised families their loved ones’ service and sacrifice, would never be forgotten. “I know that it’s difficult to find words to express your pain. But let me assure you, that as you will never forget your brave heroes, we will never forget them as well,” he said. The peacekeeping chief’s address concludes a two-day visit to the country, where he also met with members of the Tanzanian People’s Defence Force. On 7 December 2017, suspected Allied Democratic Force (ADF) fighters, a rebel militia based in neighbouring Uganda, ambushed a contingent from the UN Stabilization Mission in DRC (MONUSCO), at its Company Operating Base in Semuliki in the Beni area of North Kivu. A protracted fire-fight ensued between rebels, the UN blue helmets, and Government troops. Besides the 15 Tanzanian peacekeepers serving under the blue flag who lost their lives, 44 others were wounded. The North Kivu region in eastern DRC, has been the site of numerous assaults on UN peacekeeping forces. Two months before rebels struck last December, two other blue helmets were killed in action and another 18 wounded in an attack on their base in the same area. During 2017, more than 110,000 peacekeepers were deployed across 15 missions around the world, and nearly 19,000 UN personnel work in DRC alone, making it the second largest peacekeeping mission behind UNMISS, in South Sudan. Since its establishment in July of 2010, 154 peacekeepers have been killed, serving with MONUSCO. In response to regular attacks in the Beni area, MONUSCO and the Congolese armed forces (FARDC) jointly planned offensive operations, which began on 13 November of this year, where the alliance managed to retake key territory from rebel control, in an effort to build a future free from fear. 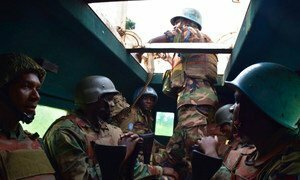 At least 15 United Nations ‘blue helmets’ in the Democratic Republic of the Congo (DRC) have been killed and many more injured, in what the Secretary-General António Guterres described as the “worst attack” on UN peacekeepers in recent history. The United Nations has honoured the nationals of 37 countries who had lost their lives while serving with UN peacekeeping missions.